Have we forgotten about Generation X? Much of the conversation in the news, politics, and workplace is focused on what the Millennials (Born 1981-1997) want, need and expect. Then there is the conversation focused on the Baby Boomers (Born 1946-1964), because this generation is aging out of the workplace, living longer, and starting new adventures. Generation X (Born 1965-1980) has the benefit of possessing the best characteristics of both, but seldom do we hear any conversation about them. Why? Just based on sheer numbers, GenX is smaller in size than the generation that precedes it (Boomers) and the generation that follows it (Millennials). Being overlooked is something that we, yes, I’m included in the number, have grown accustomed to. Gen X’ers are independent: We had to be independent and self-reliant as we were the first generation of latchkey kids. We grew up with mothers that worked outside of the home. We learned to play independently with as little as our imagination. Gen X’ers are hard workers with a heart: Gen X’ers did not receive participation trophies. We learned that you work hard or move out of the way. When we got scrapes and bruises, we were told to shake it off. While we were working hard to earn our way, we had the benefit of growing up on a daily diet of Oprah Winfrey. We learned the value of heart, empathy, self-reflection, and doing the hard work on the inside to match the hard work on the outside. Gen X’ers value diversity: Not to oversimplify this topic or to make a gross generalization but ours is the generation that saw women become astronauts. We are the generation that was not burdened with the legacy of Jim Crow but benefited from the Civil Rights wins. We grew up with the AIDS quilt. We want to see the underdog rise because we’ve been the underdog. 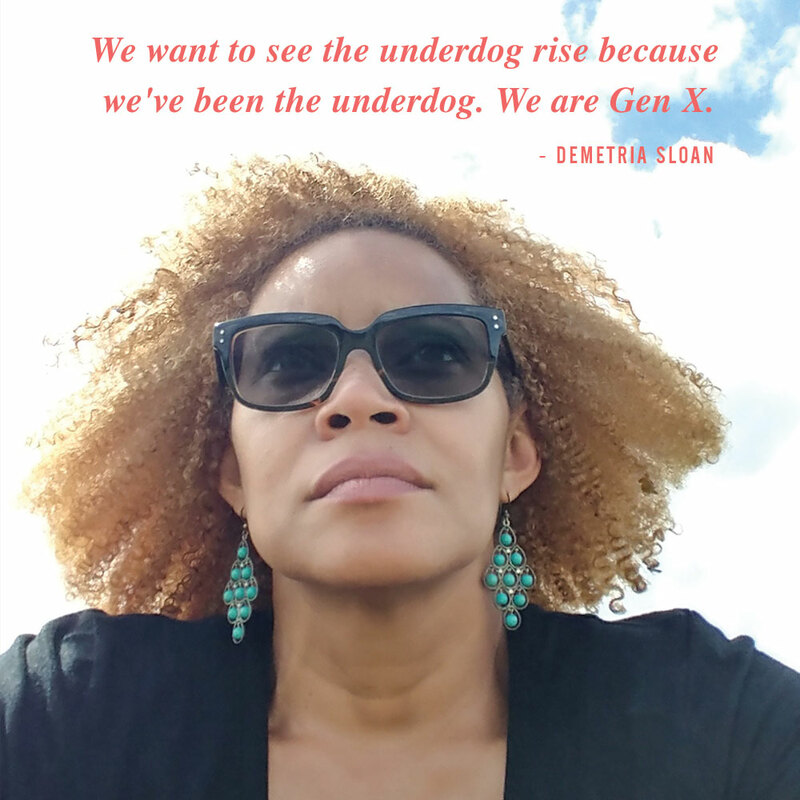 Gen X’ers have the vitality of youth with benefit of wisdom: Let’s be honest. We’ve been around long enough to know how to get things done. We understand politics, social norms, and influence it has on the world. We are the original hip-hop generation, which means we understand the rebellion of youth. We understand being misunderstood. On the one hand, we are young enough to understand new technology and speak the language of youth. On the other, we are mature and experienced enough to negotiate, move the needle in business and make things happen. Did you know, 41 percent of Gen Xers consider themselves entrepreneurs? As Millennials take over the workforce and Boomers retire at a faster clip, don’t forget Generation X is still here. We are working hard and have a lot to offer, if only you remember we’re here. Demetria Hill Sloan is a results-oriented coach, influential mentor, and outspoken motivator. She founded Vantage Point Coaching after a major career transition and deciding to live her passion of helping others achieve their absolute best. She combines nearly 20 years of sales, leadership, facilitation, and training experience with a candid, balanced communication style and unique ability to "cut through the clutter". She is committed to coaching individuals to achieve higher levels of performance and personal fulfillment and helping organizations improve performance and grow results. Residing in Orlando, Florida, Demetria is the devoted wife of Jeffrey and proud mother of Devin and Jasmine.